The University of North Georgia is trying to make amends after a controversial course catalog stirred up some negative attention when an Atlanta Journal-Constitution reporter wrote about it. According to Raw Story, the university has “apologized” and will stop distributing a continuing-education catalog that shows two smiling white men in business suits (one with hands raised in triumph) as they cross a finish line, while a woman of “indeterminate race” and a black man trail behind, appearing to have a hard time keeping up. 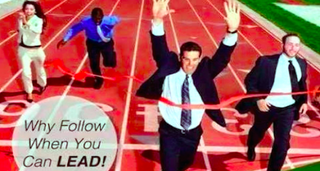 “Why follow when you can lead!” the text over the image quips. The vice president of university relations said that use of the image showed “poor judgment” but that this was unintentional and “an isolated case,” the Atlanta Journal-Constitution reported. “The image was not representative of UNG’s commitment to diversity, and this will serve as an opportunity for increased dialogue about diversity issues, and we expect that to better inform our processes and publications,” Kate Maine, associate vice president of university relations, told the Atlanta Journal-Constitution. The image has been removed from the department’s website, and social media and the catalog will be reprinted for redistribution, Maine added. Read more at the Atlanta Journal-Constitution and Raw Story.